The 8mm Ultra Wide Angle f/3.5 Fisheye Lens w/Focus Confirm Chip for Nikon from Bower gives you a dramatic 180° view with a greatly exaggerated perspective when used with an APS-C camera. 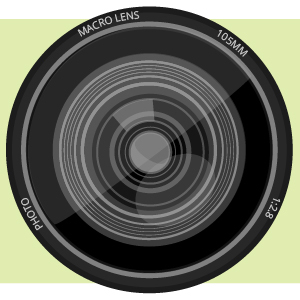 If used with a full-frame digital or 35mm film camera, a powerful circular image is produced, floating within the frame. This fisheye lens includes a special chip that allows the lens to work with the camera's focus confirm, auto exposure, auto metering and auto white balance functions. Hybrid aspherical elements and multi-layer coating help you to produce sharply defined images with a minimum of flare and ghosting. This is a manual focus lens that focuses as close as 1' (30.48 cm) from the lens. It has a built-in petal-type lens hood and comes with a carrying pouch. Box Dimensions (LxWxH) 7.5 x 5.0 x 4.0"
8mm Super Wide Angle f/3.5 Fisheye Lens w/Focus Confirm Chip for Nikon is rated 4.7 out of 5 by 32. Rated 3 out of 5 by marcmandy from Hood is *Not* removable The lens itself is fine, but it never occurred to me when I bought it that the hood would be permanently attached. It's fine if you are shooting with a DX sensor (standard digital) then it doesn't matter, but if you are shooting using an FX sensor (full 35mm equivalent), you will be deprived of the option to have a (mostly) circular image. I ended up returning this and replacing it with the Rokinon equivalent which *does* have a removable hood. It is made by the same Korean corporate entity as are at least a couple of others sold here. In all other ways they are identical.The exchange process went smoothly and was very easy because I knew exactly what I wanted. Rated 5 out of 5 by Big Ben from Would Buy Again This lens is pretty cheap but it sure doesn't feel like it. It has some heft to it but I won't hold that against it. I thought the lack of auto-focus would be an issue, but at this focal length it really doesn't matter. Most of the time I can just set it to infinity and shoot away. It works very, very well on my Nikon D3200 and setting the aperture is a breeze. The metering isn't the most accurate, but I never found it to be that accurate on my camera regardless of the lens I'm using. Many find fisheye lenses to be a novelty, and that may be the case but I think this one is awesome. This will always have a place in my bag, especially since I like to shoot landscapes while going on trips on my motorcycle. If you're thinking about getting a fisheye lens for your Nikon DX camera, get this one. You won't regret it. Rated 5 out of 5 by Craig from Great Lens I am very happy with this lens. I have the D7000 and it works great on it. I have all my dial settings for any exposure combination, but the lens has to be set to F/22 (some Nikon cameras have to be set to F/8 or lower, don't know why, may be because of in-camera settings). Very sharp. Focus is great, in close, you must manually focus, but it's easy. The lens is small, and it fits tighter than the Nikon lenses I have. Little difficult to get on and off. Pretty tight fit. Very happy with it, for the money well worth it. Rated 4 out of 5 by Glenn S. from It gets EVERYTHING in the shot! GREAT!!! I researched quite a few of these fisheye lenses before deciding on this one. I have taken some really interesting shots with this lens so far. This is not an every day lens however. Either you like the fisheye look or you don't. I do as it adds yet another dimmension to my portfolio. I love taking really wide shots of the city of Boston and this lens does the trick. It's also really neat when you are in a confined space like a car or a small room and you want to give the viewer a wide perspective. I have found this a little tight on both of my D5000's. I'd rather have the lens be tight then loose though. As others have said, get the one with the Confirm Chip. Set the lens to infinity and go take some great pictures. Rated 5 out of 5 by YYYY from Great lens!! And a Bargain too I really was a bit skeptical about buying a lens that was not NIkkor as that is all I have ever owned, but I wanted to try a fisheye lens and being as I have a full frame camera they were very expensive. I bought this lens and simply set the camera to detect the DX format each time it is attached it and off I was taking pictures. With its Nikon sensor chip I can easily tell when it is in Focus and the images are sharp and clear. I did have to make sure that I lined the indicator line up EXACTlY when attaching the lens, but other then that it works smoothly This lens is a great deal. I could not find a better one on line for the price, and I am having a lot of fun with it. Rated 5 out of 5 by DinsPhoto from Great Special-Use Lens Adding sample images to my previous review...see below. Rated 5 out of 5 by Jody from A great toy... I bought this lens for light painting. I've just learned how to use it and I absolutely love it! It takes just a few minutes to learn how to use the focus sensor. It's manual focus, but infinity is easy to set, even in the dark. Seems to be made well. This is a great lens for the price. I almost bought a used one without the light metering and focus sensor to save a few bucks, but sooo glad I didn't. I use this with my D300. Rated 5 out of 5 by frank from nice full frame 8mm lens for Nikon I only have used it on my D200 so far. Because you can input focal length and f stop into it and use some of the camera functions. What is NOT written in the provided instruction sheet is how to use it with AI Nikons. You can set it to f22 (even though it does not have a lens lock) and use it adequately on the D200. I have Not used it on other digital Nikons at this time. Focus was great (you have to MF but if you look up hyperfocal distance and chart it for this focal length, who needs focus..) metering was great. Yes, the Bower 8mm Super Wide Angle f/3.5 Fisheye Lens w/Focus Confirm Chip for Nikon would be compatible for use on the Nikon D7100 DSLR camera. I'm looking at fisheye lens, and I see that you can buy one with a removable lens hood. What are the advantages of having a fisheye lens that has this option? Some lenses, although labeled as DX or for APS-C sensors, can be used on a full frame camera with a minimum of vignetting. The problem for these lenses is the hood designed for an APS-C size sensor will cause significant darkening of the edges. Based on feedback from customers, some manufacturers have elected to make the hoods for certain lens models removable to accommodate users wanting to use the lens on a full frame body. What is the exact view degree angle of this lens on the crop sensor cameras like the D7000? So ... is this lens for Nikon cameras only? I have a Canon 5D Mark III - would it work with this? If not, what would you suggest? I am sure they make one for Canon too. The ONLY thing I know that this lens does not do is autofocus. Then again, it's not a lens you would use for run n gun shooting. It's for tight places, special effects and outdoor shooting. You can not mount a filter either but, the same lens from Nikon or Canon is what, $1200-$1500?The glass is perfect, I can not see any flaws in image quality, and with an angle of 8mm, you seldom need to focus. It is not a lens you will use every day but for this price, you can not afford to NOT have one. I shot the Moonbow (Moon at full over the falls in KY) I had just purchased mine, even with a 20mm lens you can not get this shot. You can get parts of it but not what anyone would want, the falls AND the rainbow/moonbow. on my D7100 Nikon, the auto aperture works perfectly. Focus is a manual focus lens but I normally set it to infinity (8) If you do not have the big buck it takes to get your brand name lens, you will NOT regret buying this one. Make sure to buy the one for your camera model or brand. I have the D7000, and I pretty sure this will work on it, but being my camera takes DX lenses, will this become a 12mm lens? Losing the complete fisheye effect? Will I see a full circle image or will part of it be cut off in some manner? You will get a pronounced fisheye effect with the 8mm Super f/3.5 Fisheye Lens for Nikon on the D7000. As this lens is designed for DX format cameras, even with the crop factor, its still going to be fisheye on the D7000. That being said, the image wont vignette on the D7000, it will cover the entire frame. Quick question, will this lens fit into my D3200? 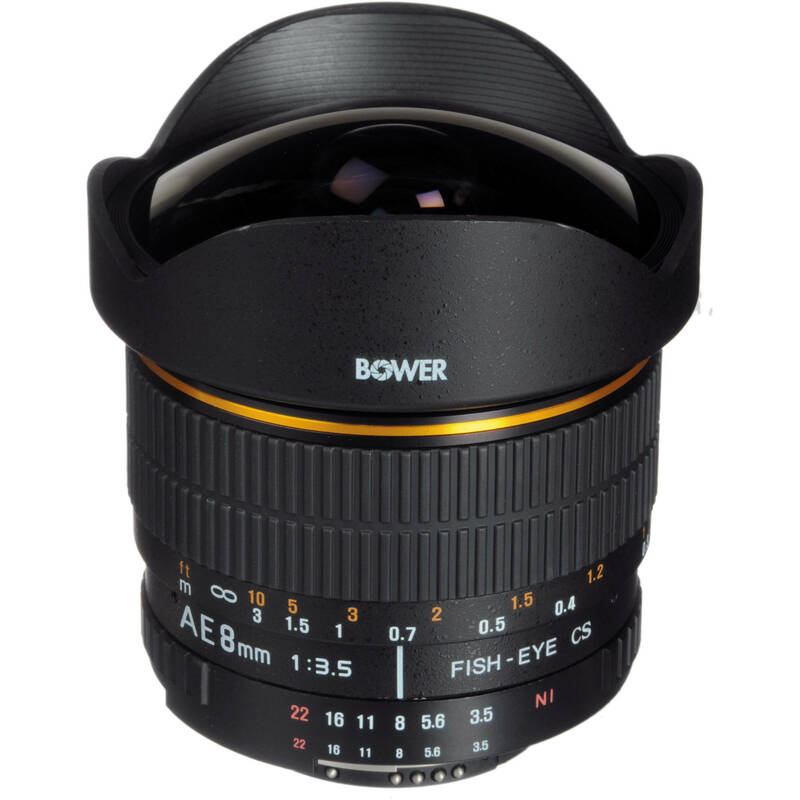 The Bower 8mm f/3.5 fisheye lens for Nikon will be compatible with the D3200. HiDoes this lens work with the D5100 camera from Nikon? The 8mm Super Wide Angle f/3.5 Fisheye Lens w/Focus Confirm Chip for Nikon is compatible with all Nikon DX format DSLRs, including the D5100. This is a Nikon F-mount lens designed for APS-C sensor cameras, so it can be used on any of Nikon's DS cameras. It could be used on an FX or 35mm camera as well, but it won't cover the full frame.Regarding Manual mode: I'm not sure how the controls on your D5300 are laid out (I use this lens on a D7100), but you would be adjusting aperture or shutter speed from the thumb wheel -- I'm not sure which control would adjust the other setting at that point. It's worth noting that you can likely customize your control layout to do what you would like. On another note, try shooting with this lens using the Aperture Priority mode. In this mode, you manually set the aperture of the lens and the camera adjusts shutter speed for the best exposure.